Most of the code for the application is included in a single main.py file which contains a single Application class to manage the running of the application and a main function to start it. The widgets module contains a helper class that we won’t cover in any detail. These are hard-coded in this example, but more complex applications would load these values from the application’s settings. The leaflet in the main area holds two pages: one with a list of thumbnails, the other with a simple image viewer. We populate the model by calling the load_thumbnails method which we describe later. 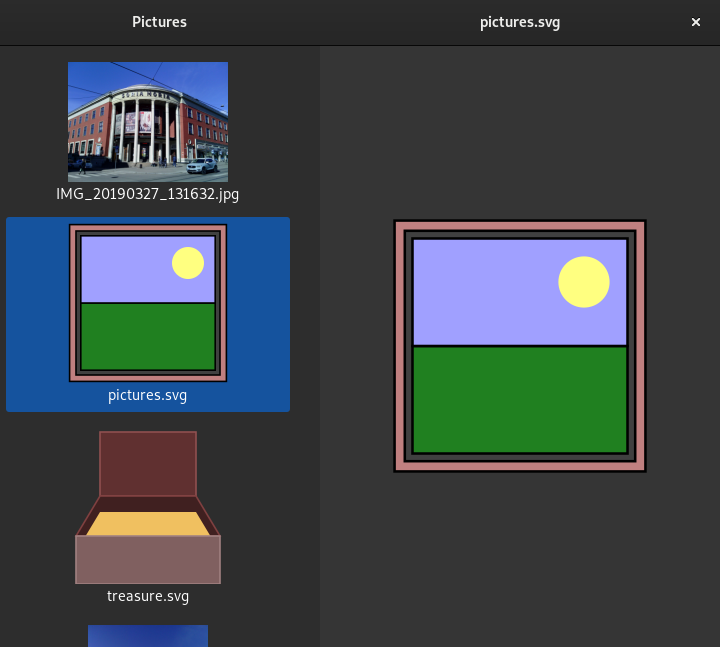 The thumbnails are displayed by a Gtk.IconView widget, using the model as a data source, and mapping the fields in the model to columns in the view. We also connect the item-activated signal to the show_details method to respond when the user clicks or touches a thumbnail. As for the first page, we also return the widget that represents the page. As described in the Files section of the Settings, User Data and Files guide, the GLib.get_user_special_dir function is used to obtain the path to the Pictures directory, specified using the DIRECTORY_PICTURES constant. Each thumbnail is added as a list of fields with types that correspond to the ones we specified when we created the Gtk.ListStore model. # Show the details page and corresponding header. We use the Gtk.TreePath passed to this method, along with a Gtk.TreeIter object, to obtain the file name of the image from the model. A good introduction to this class is provided by the Tree and List Widgets chapter of the Python GTK+ 3 Tutorial. You can access files in specific directories in the user’s home directory by calling the GLib.get_user_special_dir function to obtain the file paths you require. The directory you want to access is specified using a value from the GLib.UserDirectory enum. In this case we use DIRECTORY_PICTURES to access the user’s Pictures directory and load images using the GdkPixbuf.Pixbuf class, using the new_from_file_at_scale method for thumbnails and the new_from_file method for full size images. Note that the load_thumbnails method will only return once all the images have been loaded. If the user has a large number of images in their Pictures directory then the user interface will be unresponsive when the application starts. We could use a background thread or some kind of lazy loading mechanism to make image loading appear quicker.